If you are a pagan in the London area and have time over the next three weeks, go and see the Emily Carr exhibition at the Dulwich Picture Gallery. You won't regret it. I went there on the off-chance because I had couple of hours to spare and an Art Pass - and was absolutely blown away. I'd been looking for something to do and browsed on the Art Pass website to find out if there were any interesting exhibitions at the moment. 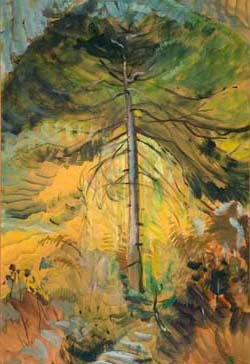 The title of the Emily Carr exhibition - From the Forest to the Sea - caught my eye, as forests and seascapes are my favourite kind of landscapes, but I didn't know anything about the artist. According to the information on the Dulwich Picture Gallery website, this is the first UK exhibition dedicated to Emily Carr, who lived from 1871 to 1945. She is virtually unknown outside Canada, although there she is one of the most loved and esteemed artists. The first room at the exhibition displays pictures of trees in a style that is modernistic and vibrant; often dark and brooding, but full of mystery and very evocative. Her writings show she experienced trees as living beings with their own spirits who will whisper wisdom to those with the patience to sit, listen and watch - and that is what comes across in her paintings. As someone who often spends time chatting to trees myself, I kept finding myself thinking: "Yes! This is what trees are really like! Just like this!" For a pagan, the exhibition just gets better and better. 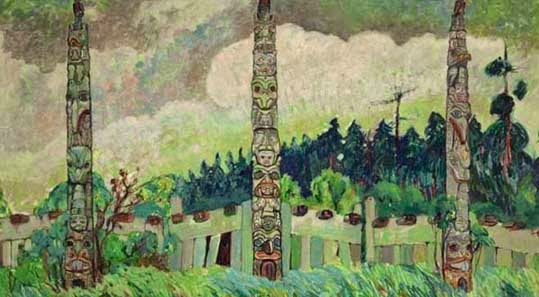 Emily Carr was also heavily inspired by the indigenous peoples of the Pacific Northwest Coast. She recorded aboriginal villages, including many items of spiritual and religious importance such as totem poles and carvings of animals and deities. This was done at a time when disease was wiping out huge numbers of the native people in Canada and their traditional lifestyles were falling into decline. Her paintings are a fantastic record of things that have now been lost, but also show her respect for the the indigenous peoples, their way of life and their beliefs. At the exhibition, Carr’s paintings are accompanied by real indigenous objects including masks, baskets, feast bowls, shamanic items and ceremonial objects by Haida, Kwakwaka’wakw, Nuu-chah-nulth, Salish, Tsimshian and Tlingit makers. Carr herself was what I would call a nature mystic. She was influenced by Theosophy as well as feeling drawn to indigenous spirituality and obviously highly sensitive to the energy within nature. The description that goes with the exhibition explains that it traces "...a dramatic trajectory from darkness to light. Visitors will first encounter Carr’s brooding, often claustrophobic forest scenes and the show will culminate in a display of Carr’s later euphoric sky paintings, rhythmic light-filled beach scenes and clear-cut landscapes." The pictures in the final room - showing enchanting seascapes and landscapes full of warmth, light and sky - are indeed a counterpoint to the earlier forests of green shadows. This is portrayed as the contrast between winter and summer - again a very pagan perspective on the turning of the year and the balance between light and dark. Linking these displays is a look at Carr’s explorations of the aboriginal communities, including her writings and sketches as well as related archival photography. As I said earlier, I can only recommend this exhibition - especially for pagans and other nature lovers. From the Forest to the Sea: Emily Carr in British Columbia is on until 15 March 2015. It is open every day except Mondays, with tickets at £10, or £5 for concessions or for those with an Art Pass.